U of MN students walk out, rally in response to white supremacist shooting of Black Lives Matter protesters | Fight Back! 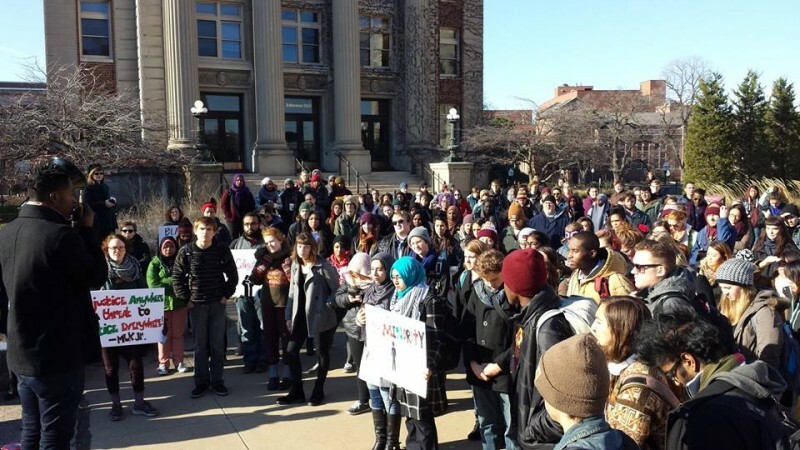 Minneapolis, MN - 400 students at the University of Minnesota rallied Nov. 24 on Northrop Plaza in response to the prior night’s white supremacist shooting of five Black Lives Matter protesters in North Minneapolis. After the U of MN rally, they went together to the city-wide march for Justice for Jamar Clark, the Black man who was executed by the Minneapolis police a week ago, sparking an around-the-clock occupation of the front of the Fourth Police Precinct in North Minneapolis. To gather students for the rally at Northrop, a group of students went through several classroom buildings chanting for justice for Jamar, and encouraging students to join them. Many did. The campus rally included powerful speeches by Javaris Bradford, president of the Black Student Union; Ken Gonzales of API’s for Equity and Diversity; Nora Abdelal of Students for Justice in Palestine and Abeer Syedah, vice president of the Minnesota Student Association. The walkout and rally were organized in just a few hours, after the news of the shooting the night before began to spread.